Their design makes them productive. Okamoto technology makes them easy-use. 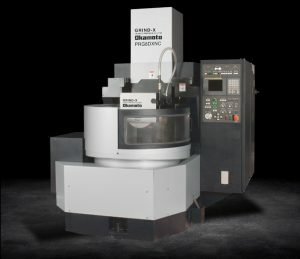 2-Axis simultaneous CNC control expands grinding flexibility. Ideal for single or multiple workpiece grinding. They’re perfect for high production precision work. Multi-step grinding – grind up to 4 steps in a single set-up. Graphic conversational input simplifies programming. Powerful 10hp grinding spindle motor.